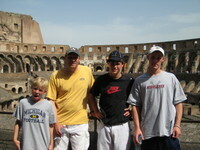 Cal, Roby and I made the long trip to Italy. Plane from Boston left on time. We encountered some nasty turbulence which wasn’t fun. Then upon arriving in Madrid to make the connection we realized that we had to go through passport control and make it to entirely different terminal — about three miles away — in less than 45 minutes. As luck would have it our tram broke down en route. We waited as the recording said "due to unavoidable technical problems this train has been detained". Luckily the got it going quickly enough for us to run about 1 mile to the gate and jump on the plane before they pulled back. 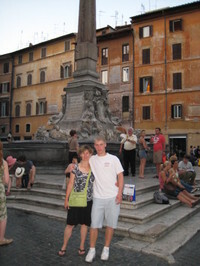 We landed in Rome on time, got our bags and took the train from the airport to downtown "termini". 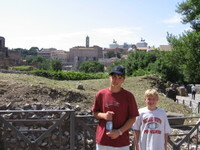 It was a really ugly and uninspiring route — not the best way for the kids to get introduced to Italy. Plus the conductor, who didn’t speak any English, informed me that I had the wrong ticket and needed to pay a penalty of $25 per person. After arguing as best I could, I showed him that all I had was 25 euros and he took that as compensation. That wasn’t a good introction to the "new" Rome for me. (I remember Italy as being inexpensive so that may be an ongoing theme as we write this journal). Once we got settled in our room we explored the forum and the colleseum which are literally just one block from our plan. It was extremely hot and we got tired fast. We came back and took a nap from 3 to 6 and then met up with Barb, Jim, Ali, and Jon and went on a tour of the pantheon. 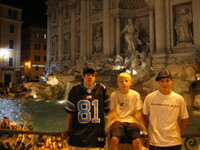 Then we had dinner together and explored Trevi fountain. It was a really nice way to end the day. It’s morning now and we’re waiting for Sue and Ryan to arrive around 1pm — we hope their travel and connection went well. It will be nice to be back together.